We have a web tier where once in a while a web node will slam our data nodes(plural) and if we could see the MB/second coming into that machine on all sockets or on individual sockets, we could immediately know which web node started to have a huge influx of doing stuff. This would be great for our monitoring capability. Is there way to see a machines "current" MB/s intake? I do not want to use a tool that tests bandwidth between nodes but rather just want to measure current status. iptables has byte counter for each rule/chain (don't know the terminology exactly). 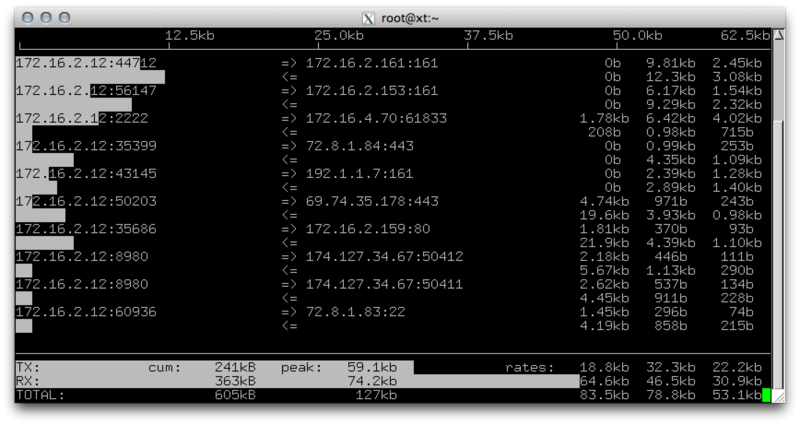 So you can setup a noop policy for the ports you are interested in and then monitor the byte counters. You can try to use the iftop command. It provides a nice curses display. This can show realtime and average statistics for an interface or specific source/destination/port. It can can also filter, but I haven't explored that functionality. This screen shows a bunch of database connections, but you can filter for whatever you're interested in. ntop will likely be what you need. It has a web interface for displaying stats on specific interfaces. It filters by protocol so you should have a decent idea. How to create a socket with mknod correctly?